“Hi, I am Dr. Curtis and I am the Doc here at Inner Balance Chiropractic. 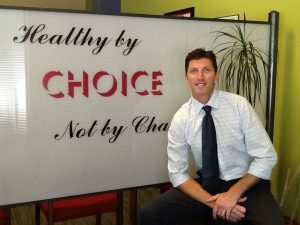 I am a Chiropractor who desires to serve and help others but Chiropractic is also a testament to my way of life; a way of life that includes eating healthy, regular exercise, reducing and managing my own and my family’s stress levels, while also getting my spine checked regularly. If people knew how important a healthy spine and nervous system are to real health, then they would be getting checked regularly too! Like millions of people worldwide, I was led to chiropractic through an injury I suffered in my twenties when I broke my T12 vertebra. Several medical doctors offered me only highly invasive alternatives which I turned down. On the contrary, a chiropractor recommended by a friend, was the answer to my dilemma. After a thorough history and examination, he started a chiropractic regimen and had me good as new in no time. Amazed at these life changing results, I decided to attend Western State Chiropractic College in Portland OR, where I graduated in 2000 with my Doctor of Chiropractic Degree. Born and raised at 8000 ft., in Mammoth Lakes, California, I truly grew up in a sporting lifestyle. After finishing my chiropractic studies I followed my dream to see Fausto Coppi’s Country and ride a Colnago bike. So I moved to Italy where I established and ran an awesome chiropractic practice for 14 years. I didn’t speak a single word of Italian but nevertheless the results that chiropractic regularly gave my patients did the talking for me. I was surprised and impressed myself that the patients continued to come and bring their entire families. In my career I experienced patients from all walks of life with the full spectrum of conditions, from newborns to geriatric an everything in between. Due to my 6’4” athletic frame and avid bike riding, I became a go to chiropractor for many professional athletes and on several occasions treated the WWE Wrestlers while they were on tour in Italy. My technique is gentle yet deep and effective and has shown to be very efficient in those patients suffering from pathology and symptoms evolving from cervical and lumbar disc herniation. I am happily married to the love of my life, Giovanna. We have 3 wonderful children, Thomas 10, Thea 9, Noah Tyler 4, all of whom have been under my care since the birth room. You can meet me anywhere there is something sporty, I am a passionate and avid skier and every bike trail in the area is my second home. Or if you are feeling less adventurous stop by 114 E. Oak St… I’d love to meet you and learn more about you! LOOK FOR THE RED DOOR!